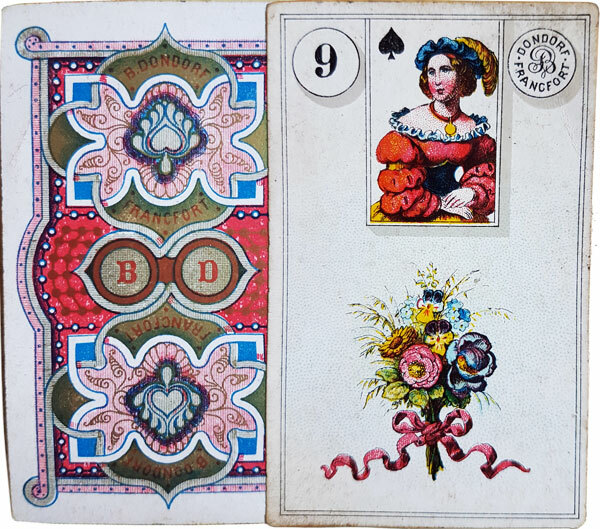 Dondorf's varied range of playing cards and card games includes a Fortune-Telling set which is sometimes named after the French fortune teller Madame Lenormand. 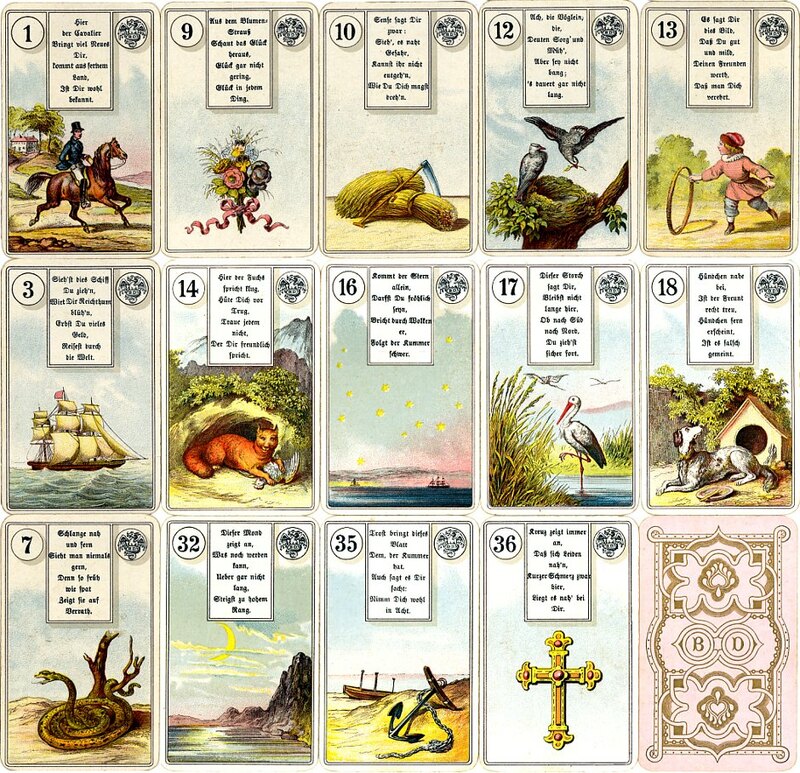 These iconic fortune-telling images were first devised for 19th century card readers, and are here re-drawn and printed in chromolithography by B. Dondorf. Two different versions exist. In one version an explanatory verse is printed at the top of each card; the other version has a miniature playing card at the top. 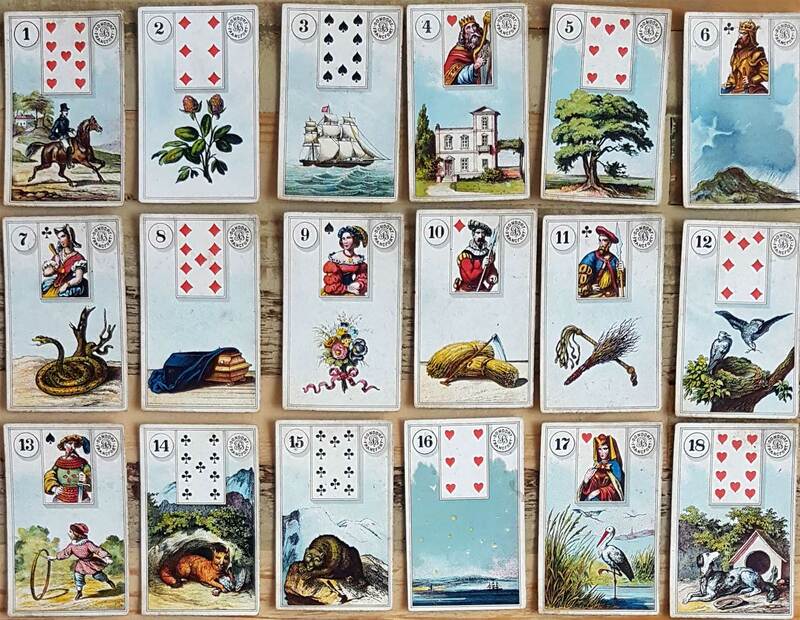 Lenormand cards have always been popular. They read in a very practical everyday way, gypsy-style. There's less room for interpretation, their reading style is very direct. There's no metaphysical or psychological layer, the way there is with Tarot. 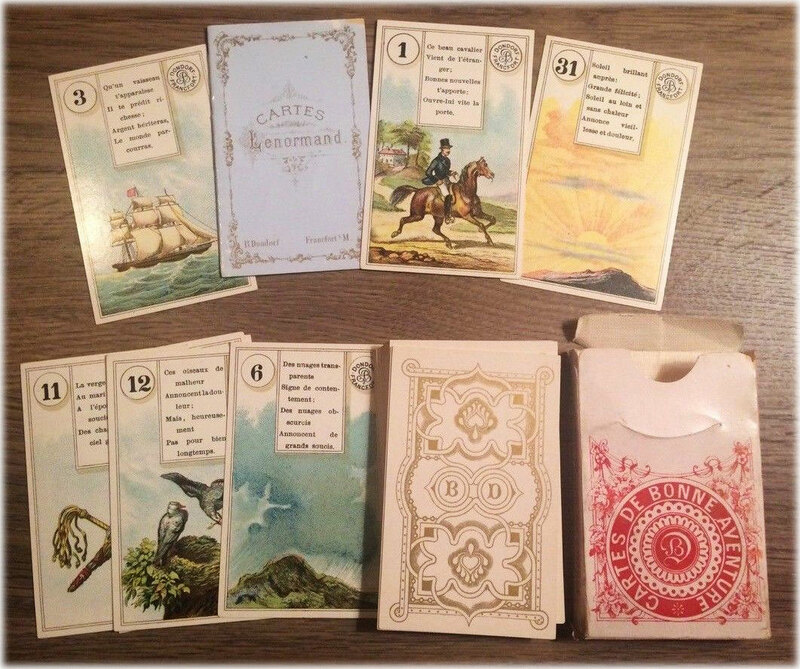 They were published in French as “Cartes de Bonne Aventure”. They are published today in a variety of languages and styles. 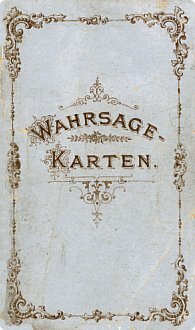 Above: cards from Dondorf's "Wahrsage-Karten" Madame Lenormand fortune-telling cards with an explanatory verse printed at the top of each card, this set with rounded corners, c.1911-1933. The back design has the letters 'B.D.' 36 cards in box. Images courtesy Barney Townshend. Top image courtesy Otto Dhr Van Steenis. See also: Lenormand Cartomancy by V.S.S, c.1890s • Cartes Lenormand by H.P. Gibson • Carreras Fortune-Telling Cards • Book of Fate • Buena Suerte Cartomancy, c.1975 • Cartas Gitanas • Cartomancy & Divination Cards • 17th Century Fortune-Telling Cards • Geistliche Karten, 1718 • German Fortune Telling cards, c.1818 • Madame Lenormand Cards by J. Müller, Switzerland.